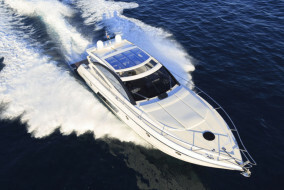 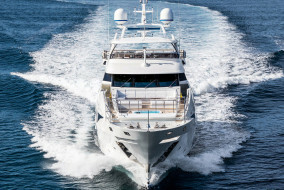 Ferretti is used to decline the expression “luxury on the sea”: so they couldn’t fail with the new Ferretti Yachts 720. 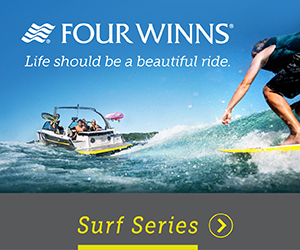 And they didn’t. 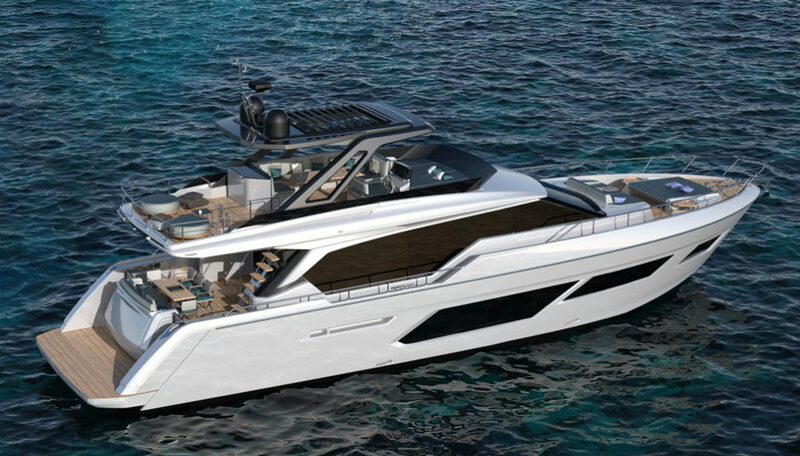 The are working feverishly in order to be ready for the launch in summer of 2019. 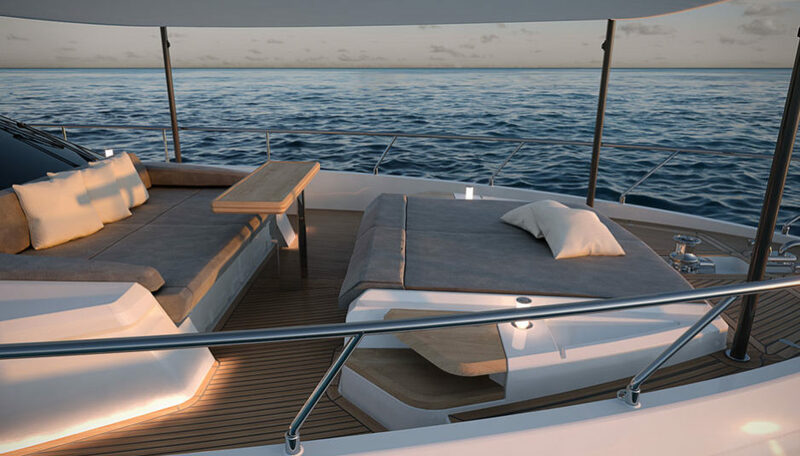 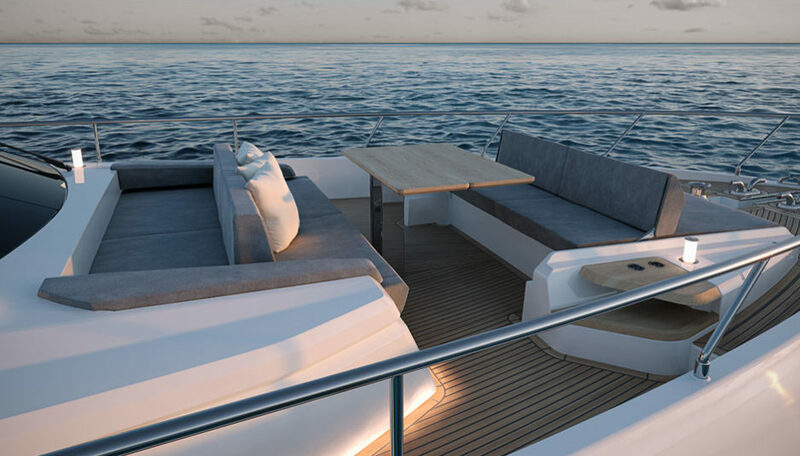 Nothing on the Ferretti Yachts 720 will be ordinary, because cruising aboard the new model will have to be an unprecedented experience of luxury, comfort and wellness, due to an obsessive attention to the quality of design, furnishings and details. 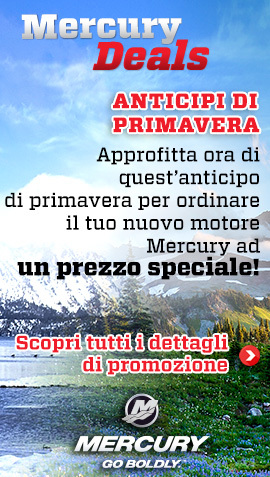 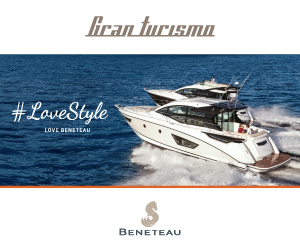 An innovative layout and versatility in stylistic choices are part of the brand heritage. 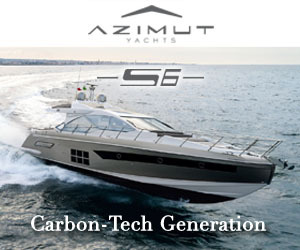 They barely had the time to introduce it, and the first unit was sold. 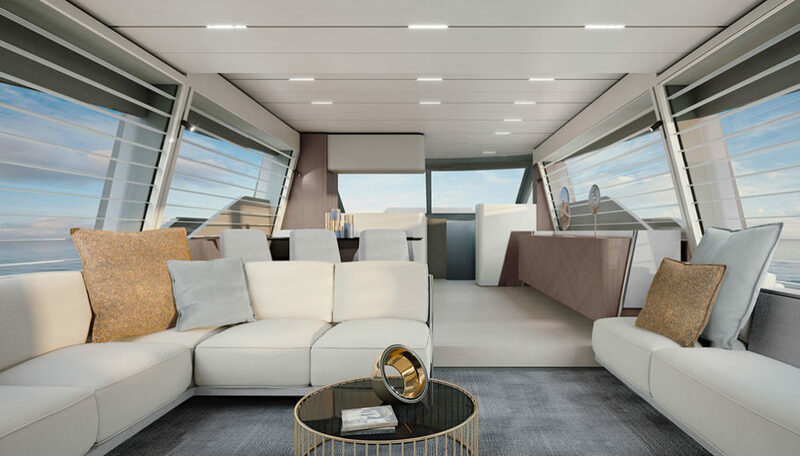 It was 2018 Cannes Yachting Festival, and all they had were the blueprints. 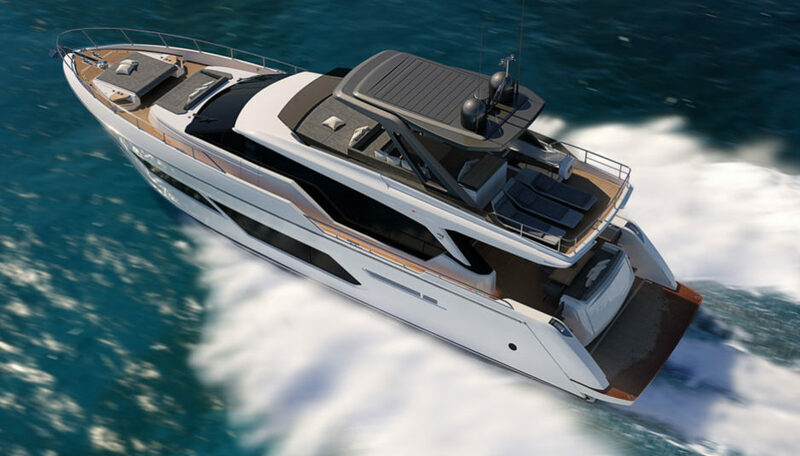 Ferretti 720 is, like all the models of the brand, the result of the collaboration between Product Strategic Committee and Ferretti Group Engineering Management. 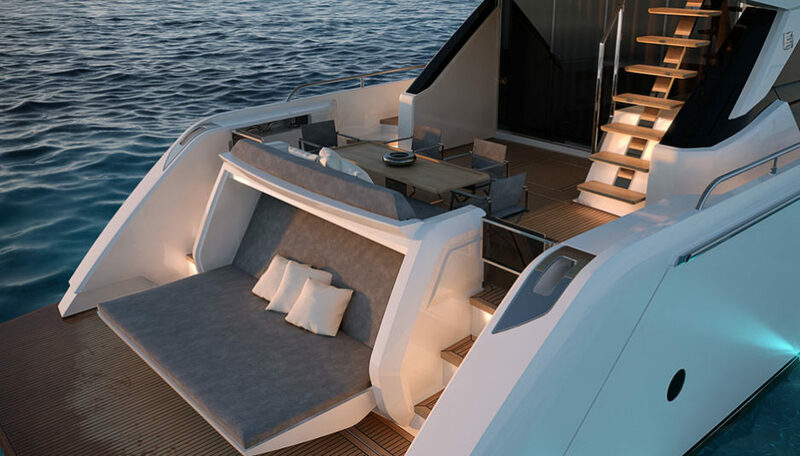 In this case and for the second time ever, the exterior design is by the architect Filippo Salvetti (in collaboration with the Ferretti Group, who also designed the interiors). 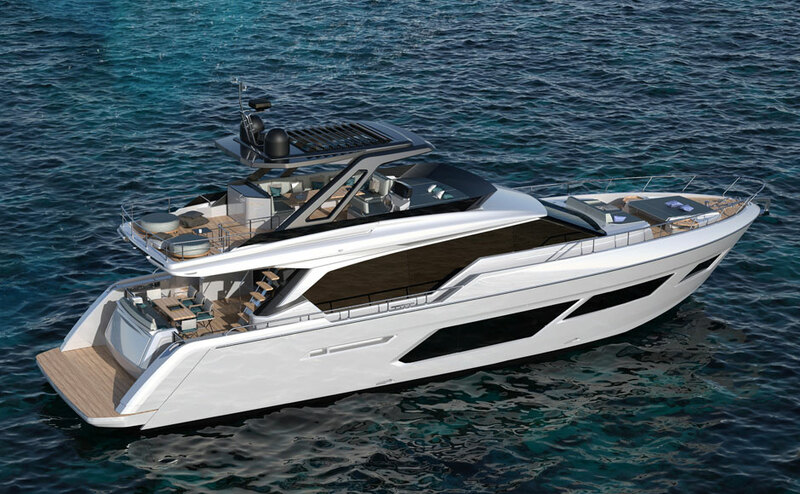 Many elements catch attention, starting from the sleek design with sporty and harmonic lines: this is the latest Ferretti Yachts family feeling, entirely refreshed in the last three years with the debut of Ferretti Yachts 670, 780, 850 and 920. 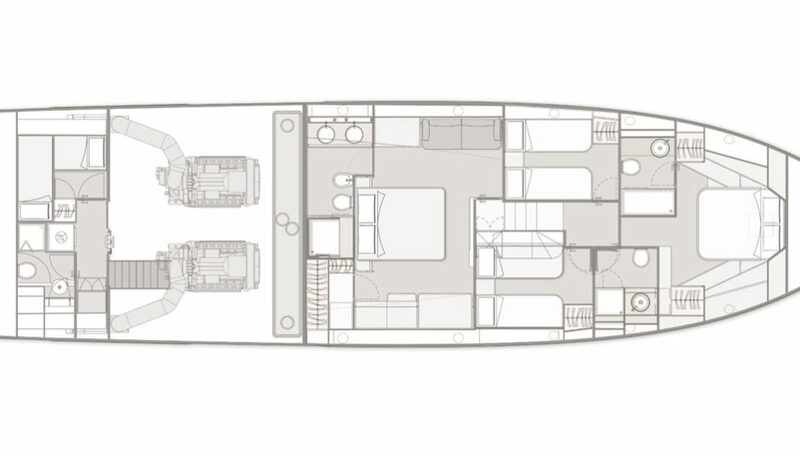 22.30 meters (73.4 feet) long and 5.60 m (18ft 4in) wide, Ferretti Yachts 720 provides functional and innovative solutions on board. 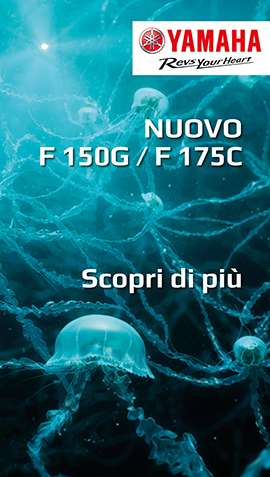 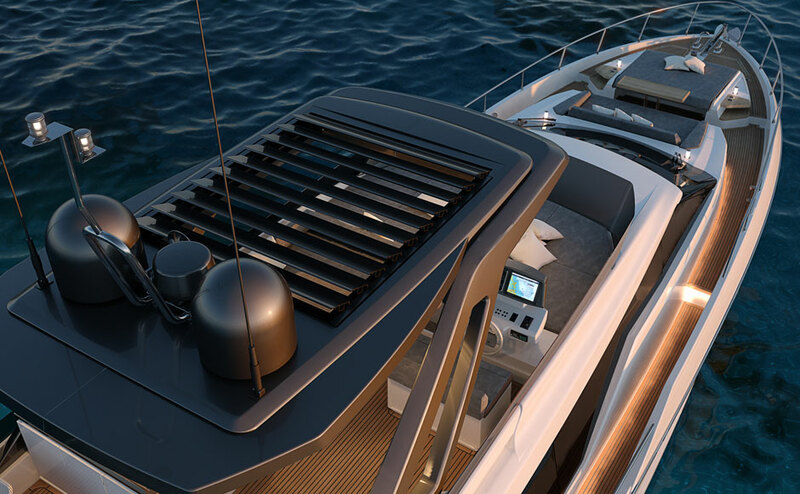 In continuity with the innovative process introduced on the new models, the external bow area is characterized by large and interchangeable living spaces. 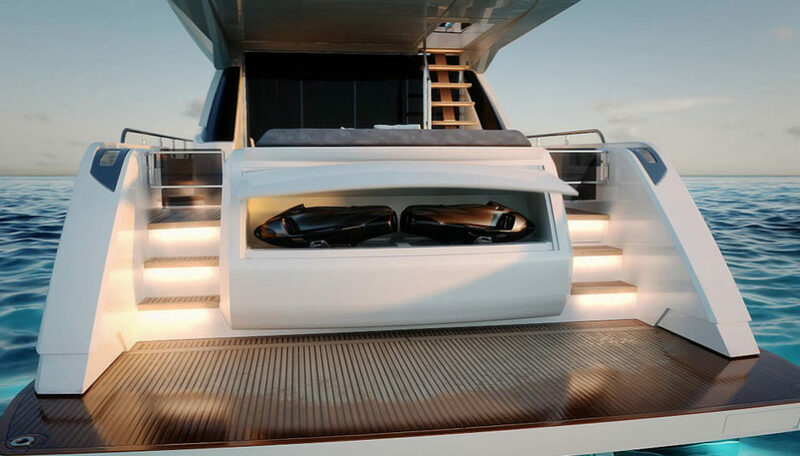 The 30 sqm flybridge, built in carbon fiber and composite materials, is surmounted by a hardtop available in three versions: with fixed glass, with integrated bimini or with opening sections. 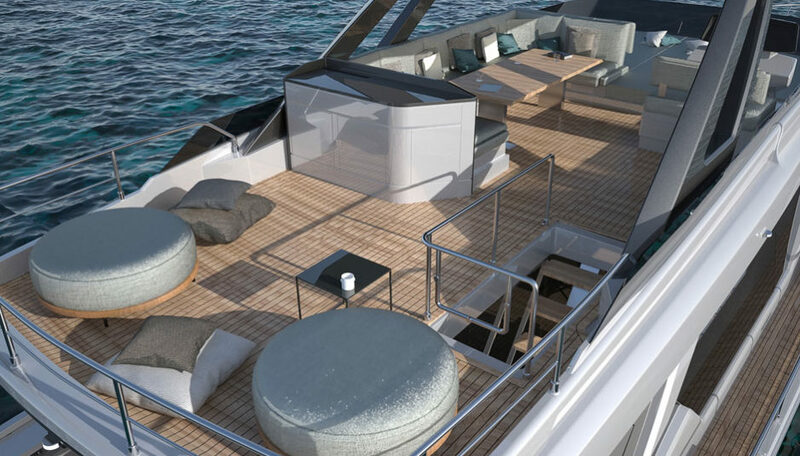 The stern platform is a terrace on the sea with a convertible chaise longue and ample storage. 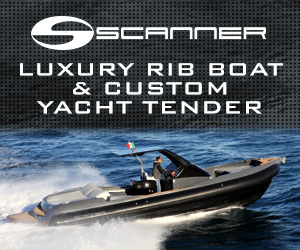 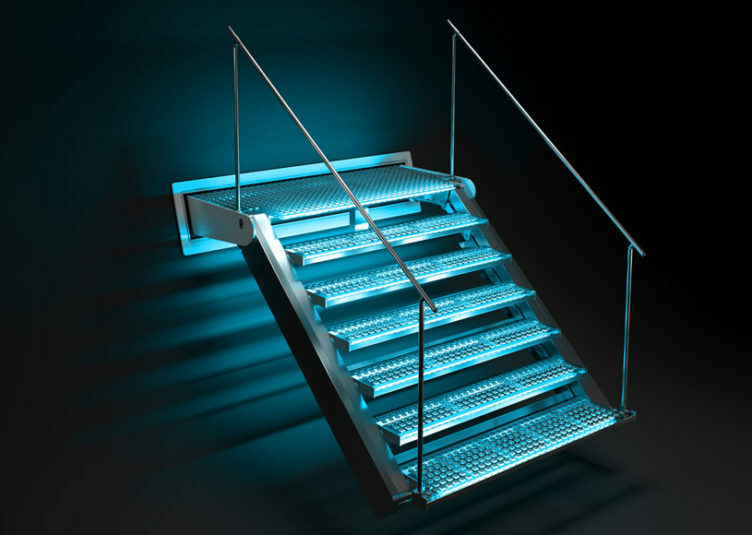 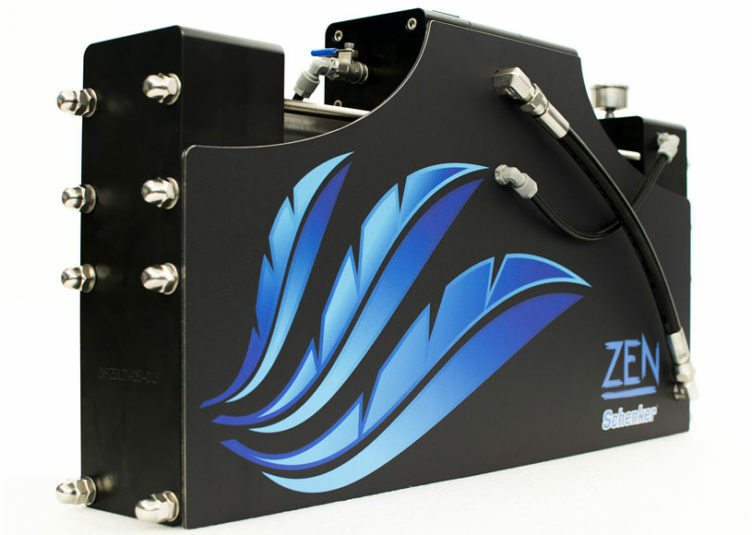 It can accommodate a tender up to 3.95 meters in length. 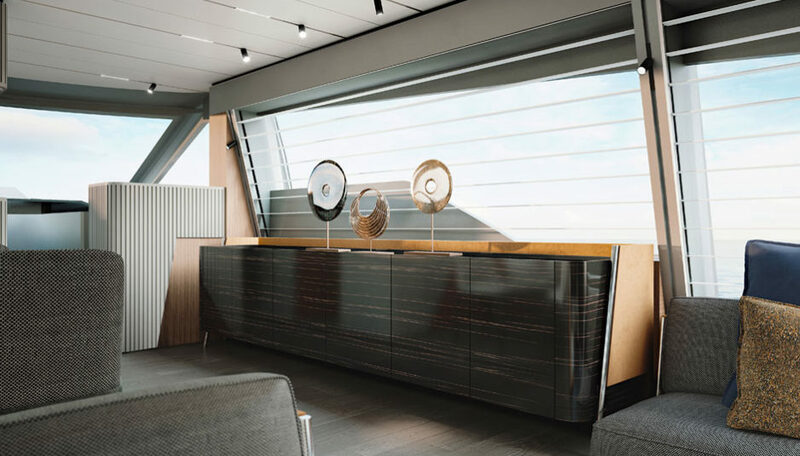 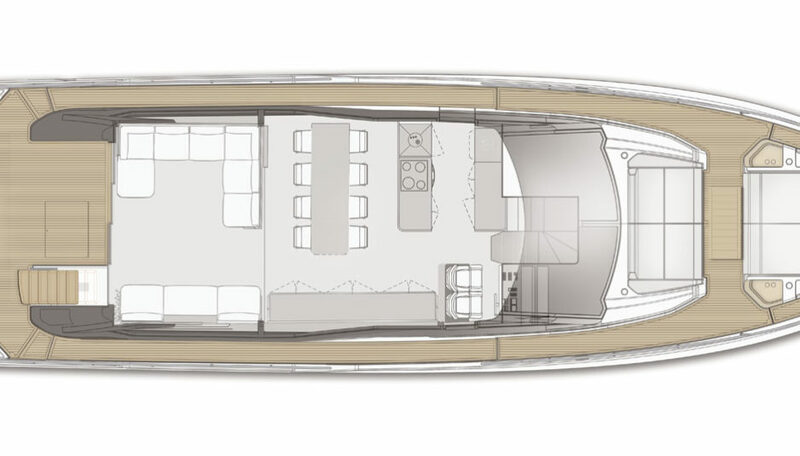 The interiors of Ferretti Yachts 720 decline the meaning of well-being and comfort according to the shipyard. 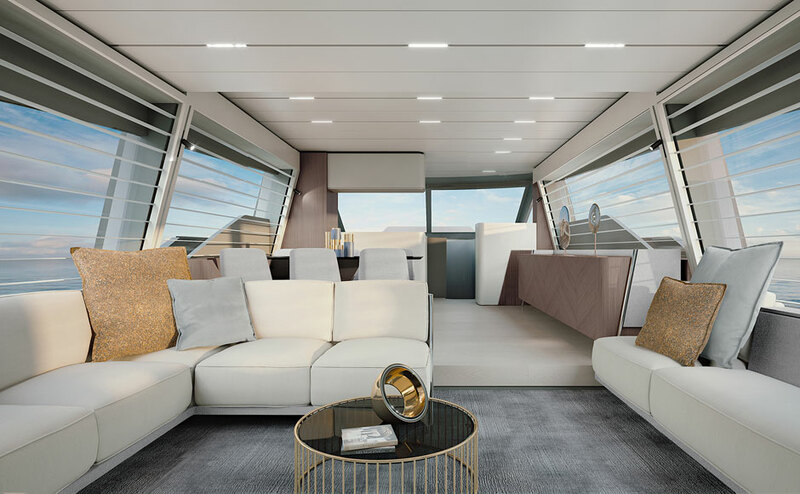 A large open space is organized in three areas: the living, with two large facing sofas, is separated from the raised dining area to offer absolute comfort. 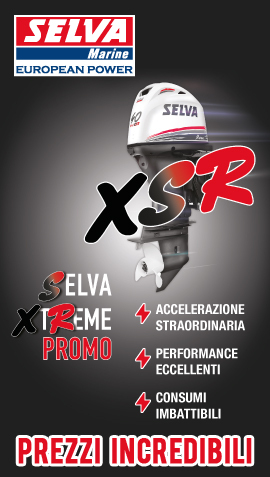 To bow, the helm station features the Naviop-Simrad Loop systems and the electro-hydraulic steering developed in collaboration with Xenta. 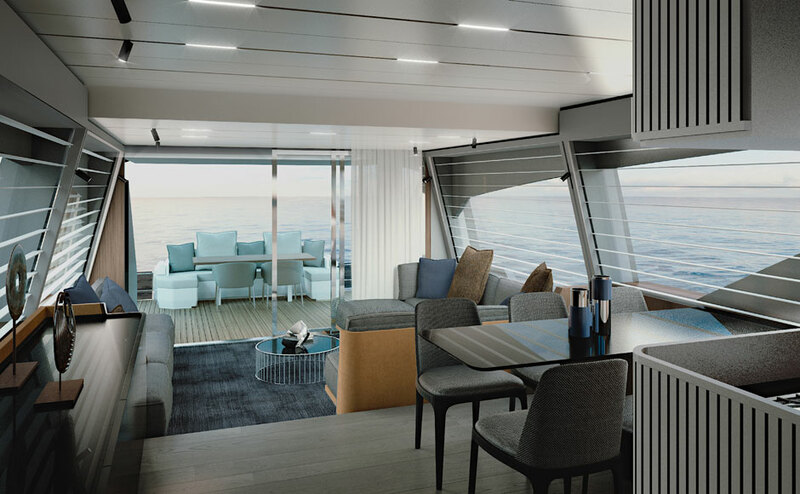 The lower deck has four cabins. 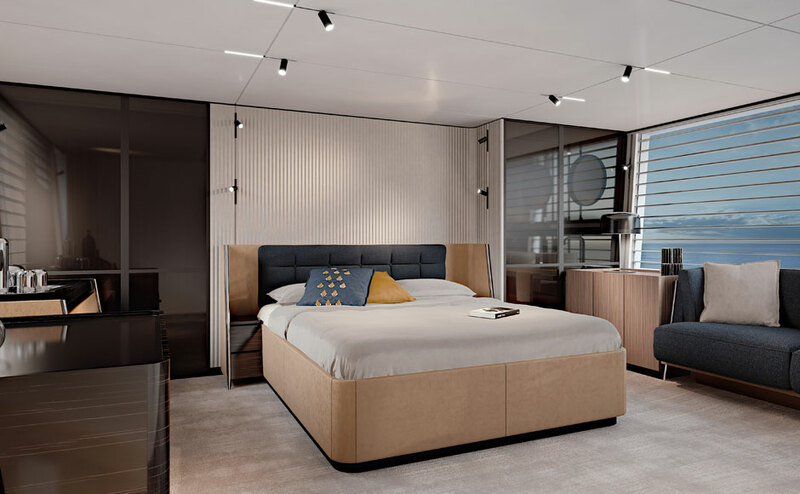 The owner’s suite amidships is a full beam, 20sqm room, while on the starboard side there’s two double cabins with twin beds that share a bathroom / day toilet. 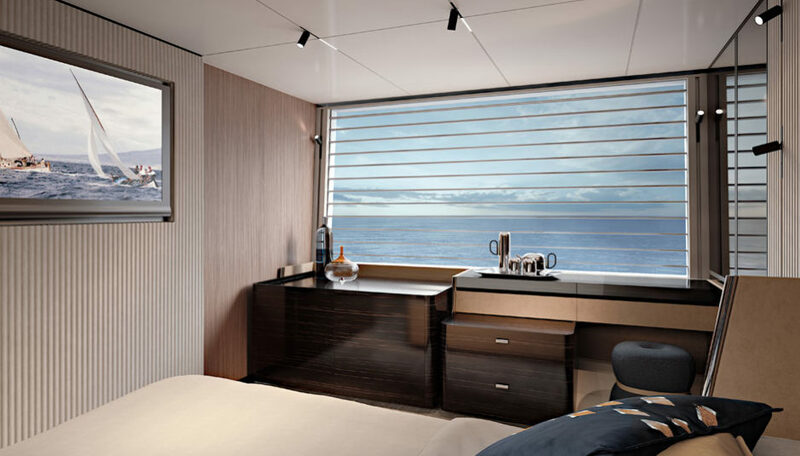 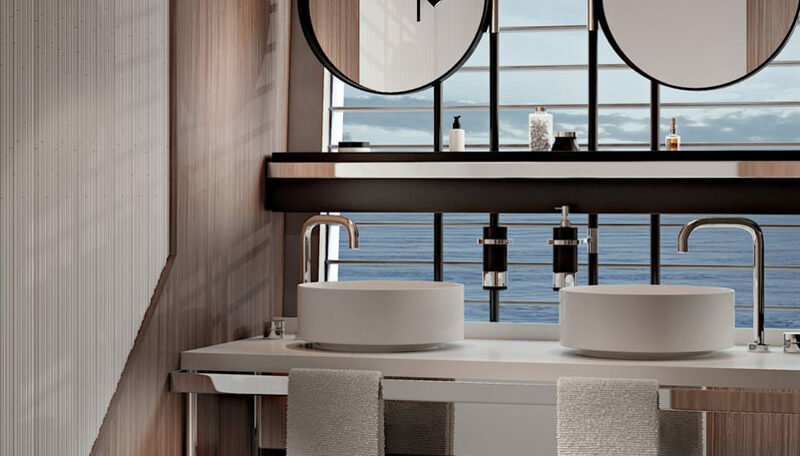 To bow, the VIP cabin sports en-suite with separate shower. 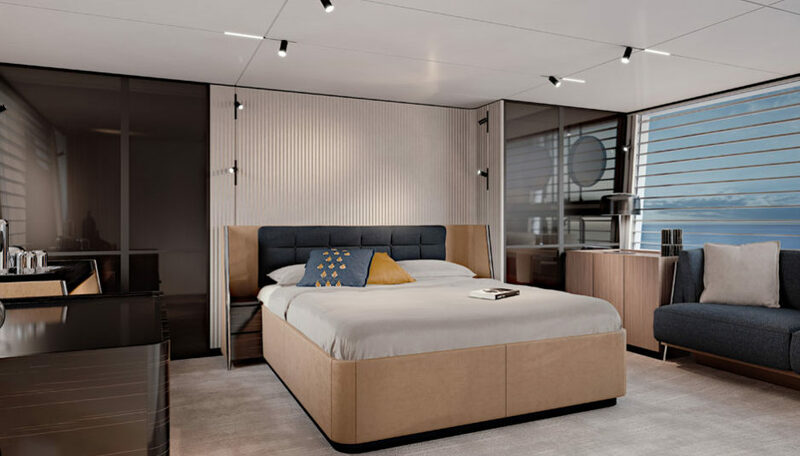 As for the interior decor, the shipyard gives the owner the chance to choose between two different set-ups and color schemes: similar to what they offer on the Ferretti Yachts 670. 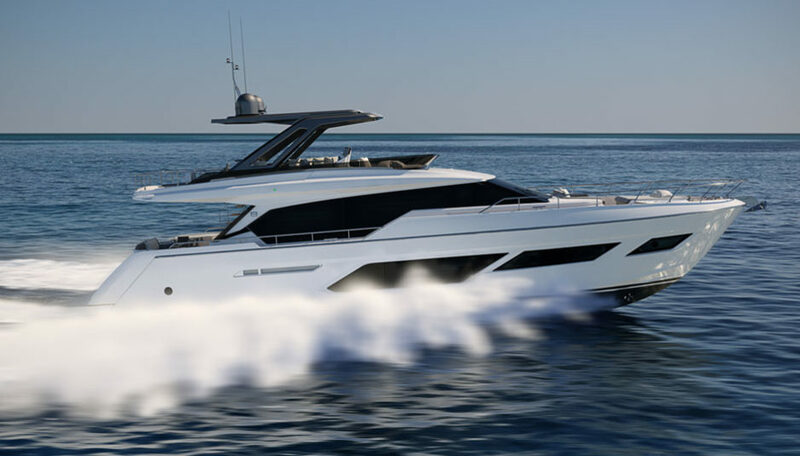 The first unit of Ferretti 720 will be propelled by a pair of 1400 hp MAN V12 engines, which should be enough for a top speed of 32 knots and a cruise of 28. 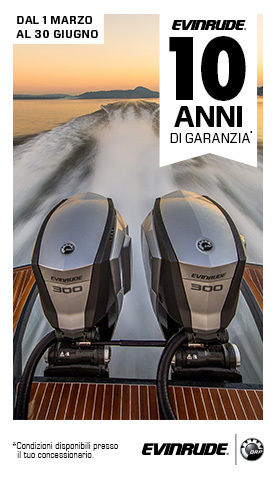 The smaller, standard powertrain consists of two 1200 hp MAN V8s. 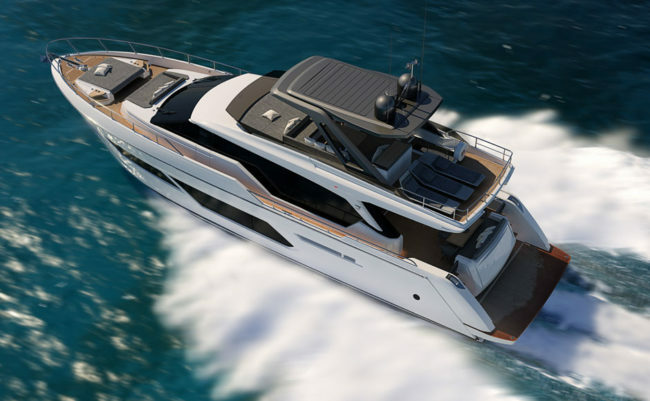 Following the markets’ demand, Ferretti Yachts 720 will also be available in the special Tai He Ban version, dedicated to Asia-Pacific owners. 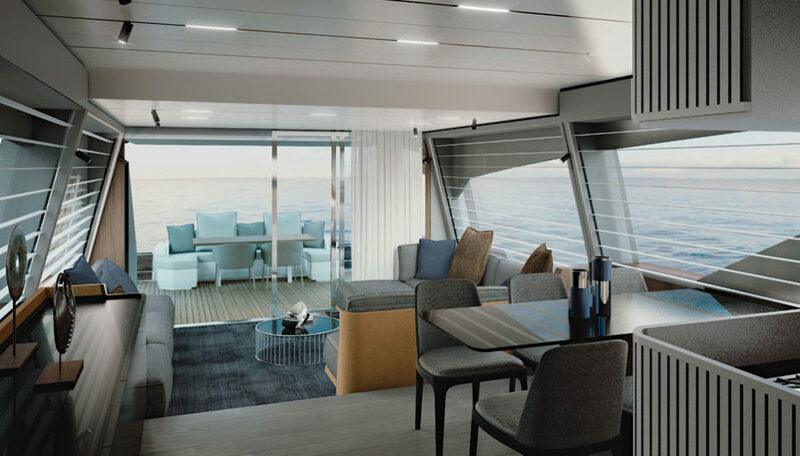 This means having the galley on the lower deck, while on the main level there is a larger dining room with a round table for all the guests. 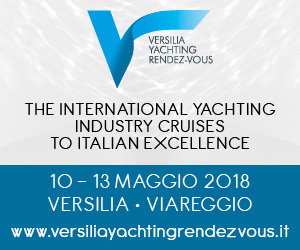 As we know, boaters from this part of the world prefer their yachts to stay moored as a villa rather than cruise in the sea. 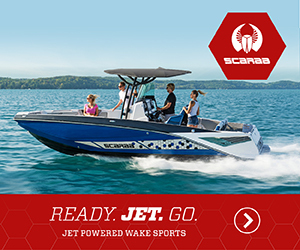 Evinrude E-Tec G2 is the outboard of the future?